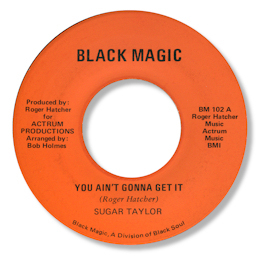 I’m pretty sure that this super rare 45 on Roger Hatcher’s own label was the only one that Sugar Taylor ever recorded. The song is based on the chord changes of "Mr Big Stuff" of course but I love the funky lilt that arranger Bob Holmes gets going here. Sugar herself is suitably firm and confident in her interpretation of Hatcher’s no nonsense lyric. This was cut in Nashville and I would suppose that it was while Hatcher was making his own excellent and highly sought after “R & Better” album which came out on Guinness.